Protest in Har­mo­ny made a strong show­ing at the March and Ral­ly against Tri­dent on 4th April, with our very own Pen­ny Stone lead­ing some singing from the stage in George Square, Glas­gow. 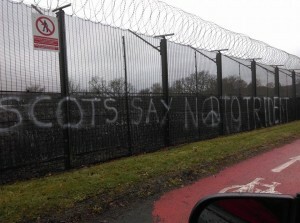 About a dozen of us set off at the crack of dawn on 13th April to help with the suc­cess­ful block­ade of Faslane. Two more attempts to bring san­i­ty into the world!